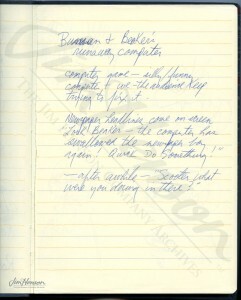 In the late 1970s, Chris Cerf (Sesame Street writer, composer, and computer aficionado) became completely enamored with Apple computers and inspired writer Jerry Juhl and director Jon Stone to join the revolution. Soon, the Henson accounting and legal offices were equipped with Apple computers. As the 1980s dawned, Cerf, for Sesame Place, and Faz Fazakas, for Henson, were experimenting with digitally controlled animatronics. Cerf was consulting with Children’s Television Workshop on developing home video games and in 1982, for Jim, helped develop the “Hi-Res Dark Crystal Adventure” game by Sierra On-Line for Atari and Apple II. There were other licensed games featuring entertainment properties (like Sesame Street) in early years, but, according to the video game blog “The Stack,” The Dark Crystal was the “first movie to be adapted as a graphic adventure.” Jim, naturally, saw great potential to expand in this area for all of his character groups and must have been excited to meet with Alan Kay, Atari’s chief scientist at the time. Kay is credited with the expressions, “The best way to predict the future is to invent it,” and “If you don’t fail at least 90 percent of the time, you’re not aiming high enough.” He and Jim must have seen eye to eye on many things. Jim and his team, working with Atari, began development on a “Pigs in Space” game (released in 1983) and a “Miss Piggy’s Wedding” game which only made it to the prototype phase. Jim’s sketchbook from that period includes ideas for a Bunsen and Beaker game, and his creative group spent several months trying to develop a Fraggle Rock video game. But it wasn’t until the release of Labyrinth in 1986 that another Henson computer game would appear in stores. 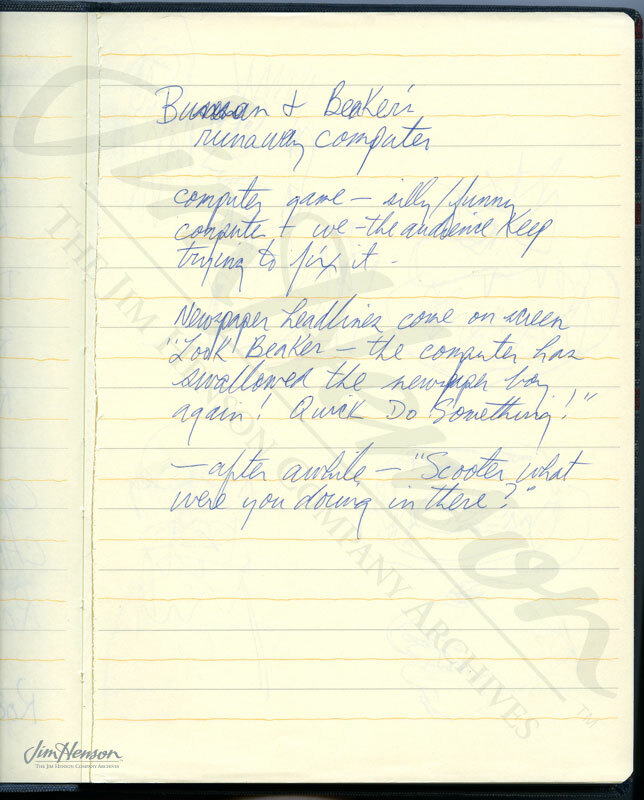 Jim’s notes about a Bunsen and Beaker computer game, 1983. 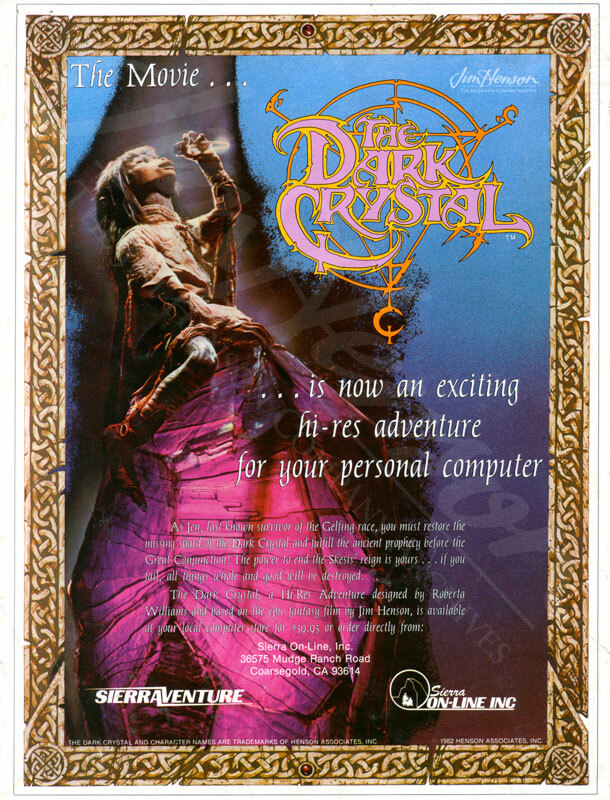 Advertisement for The Dark Crystal hi-res adventure computer game, 1983. This entry was posted in Uncategorized and tagged Alan Kay, Atari, Children's Television Workshop, Chris Cerf, Dark Crystal, Faz Fazakas, Jerry Juhl, Jon Stone, Labyrinth, Sesame Street. Bookmark the permalink.